Bird flu, also called the Avian influenza, is in the news again. Here are few myths and facts about bird flu that you should know. Myth: Bird flu is a death sentence. Fact: Every person who contracts the bird flu virus does not die. The H5N1 virus is often, but not always deadly. Myth: Humans can transmit the virus. Fact: Humans cannot transmit the virus unless there is very close contact. The virus cannot spread from person to person in public. The infection occurs after direct contact with the infected bird or its excreta. Myth: Eating infected eggs or poultry can cause bird flu. Fact: Medical experts agree that eating infected poultry cannot cause bird flu. When the poultry and egg is perfectly cooked, the heat will kill the virus responsible for bird flu since the virus H5N1 is susceptible to heat. Myth: Being a vegetarian can protect you from bird flu. Fact: Infected persons can spread the infection through fruits or vegetables. Removing meat and poultry from the diet may not protect you against bird flu. 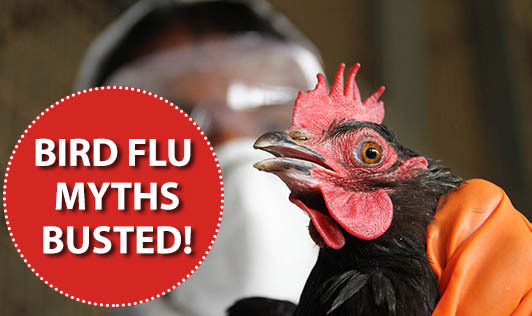 Myth: Using anti-viral drugs will prevent bird flu. Fact: Taking anti-viral drugs without any signs and symptoms will not prevent bird flu. Overuse of these drugs will cause the virus to mutate and become resistant to these drugs. So, the drugs may not work when you actually need them. Myth: Bird flu can only be contracted from poultry. Fact: It can be contracted through infected persons or infected fruits and vegetables. Myth: The bird flu is lethal in all birds. Fact: Many birds infected with bird flu do not show any symptoms. Migratory birds infect local poultry and other birds and this is when the virus becomes lethal. Myth: There is a vaccine for bird flu. Fact: There are no vaccines available for bird flu yet. The common anti-viral drugs are no longer effective due to the over-usage of these drugs.